The Harvard Center for Gastrophysics? 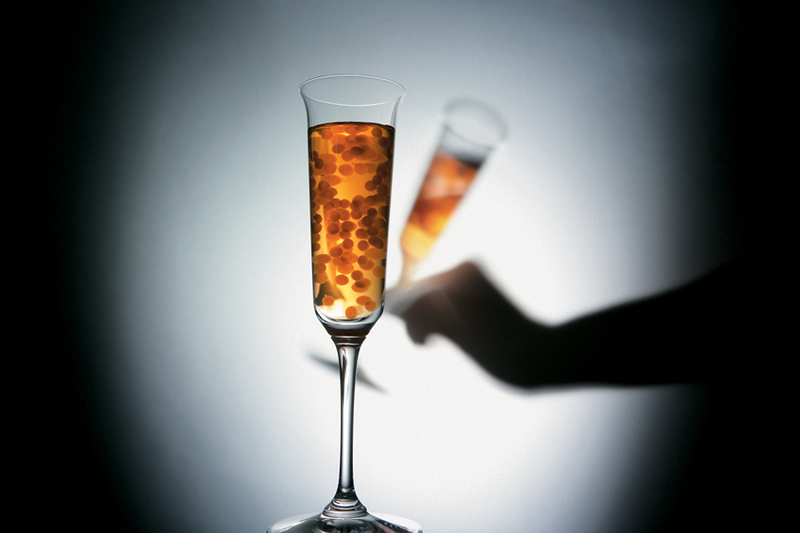 The University partners with the father of molecular gastronomy. 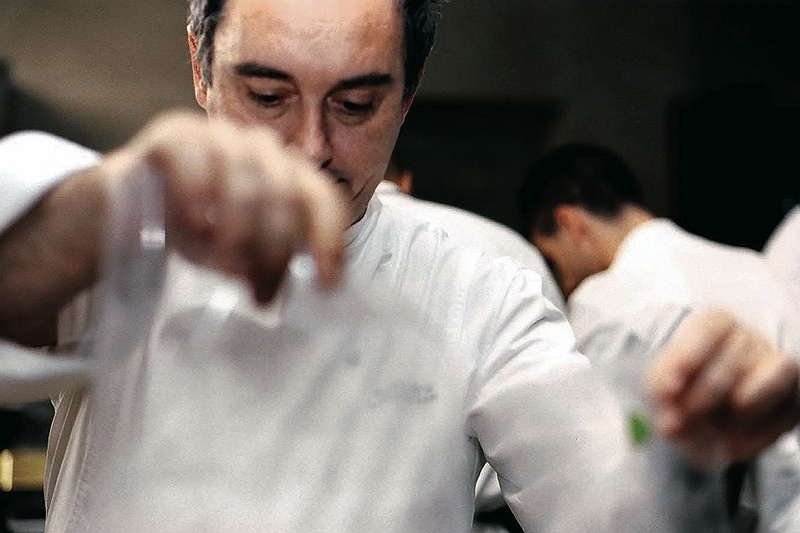 Celebrated chef Ferran Adrià mingles cooking and science at elBulli, his restaurant near Barcelona. 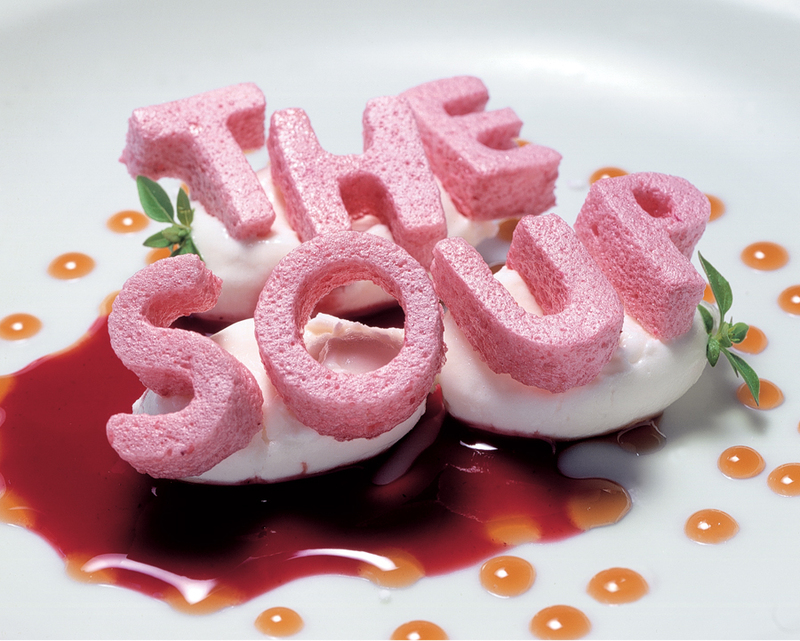 This dessert from elBulli, "alphabet soup," masters the element of surprise with its "letters" of crunchy, dehydrated strawberry meringue. 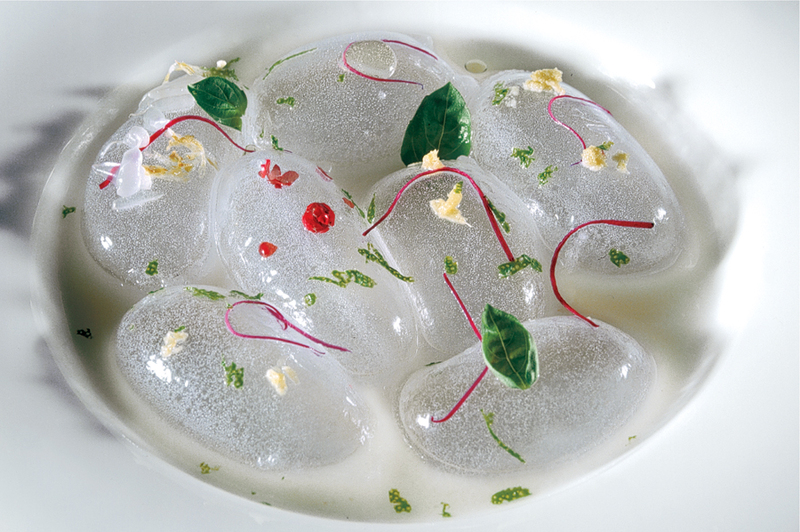 This dish from the elBulli kitchen, "spherical balloons of rosewater with touches of lychee," uses Adrià's trademark spherification technique. 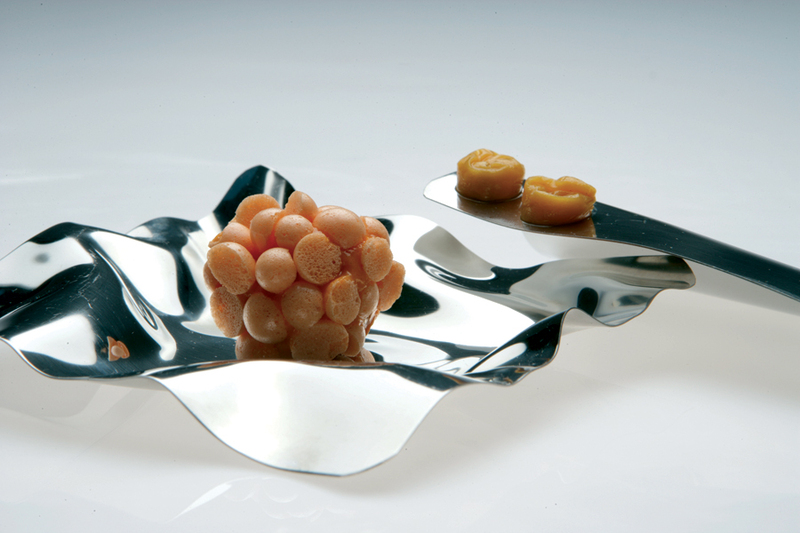 Melon "caviar" in ham consommé puts a familiar flavor combination into a new textural context. 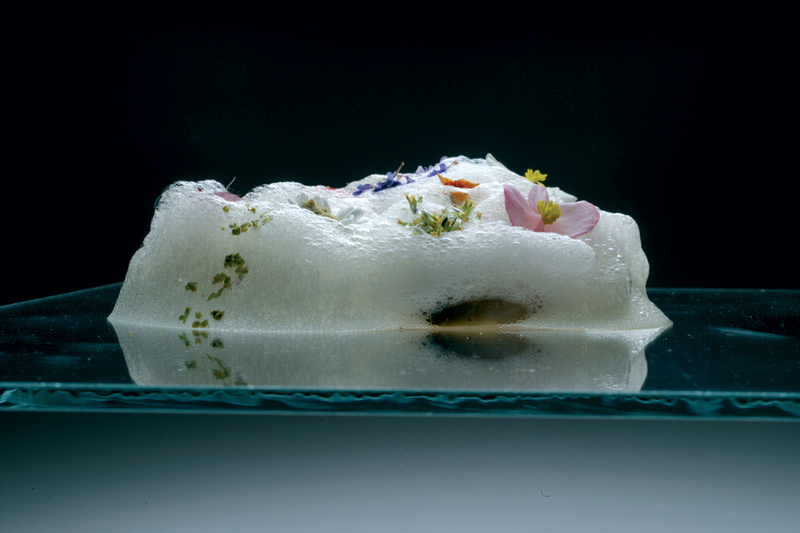 This dish, "air of honey with flowers and pistachio nuts," uses another Adrià trademark, culinary foam. More fun with culinary foam: "carrot air with bitter coconut milk"
One of the first "spherical" dishes tried at elBulli: the large oval "raviolo" has a gelatinous shell and a liquid center, and tastes of peas; the second spoon contains a salad of fresh peas and mint oil. Adrià plays with texture and temperature: "white asparagus, in various temperatures and preparations, with egg-yolk shots"
Watch video excerpts from the public lecture. 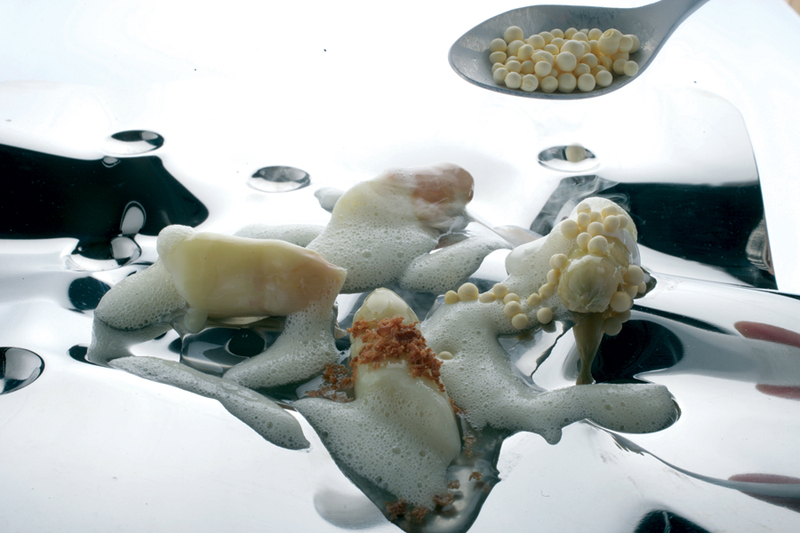 Ferran Adrià described the development of techniques in use at his restaurant, elBulli—and how he became a chef who takes chances. See this more detailed account of Adrià's time at Harvard, filed soon after his visit. Surprise is Ferran Adrià’s stock in trade. 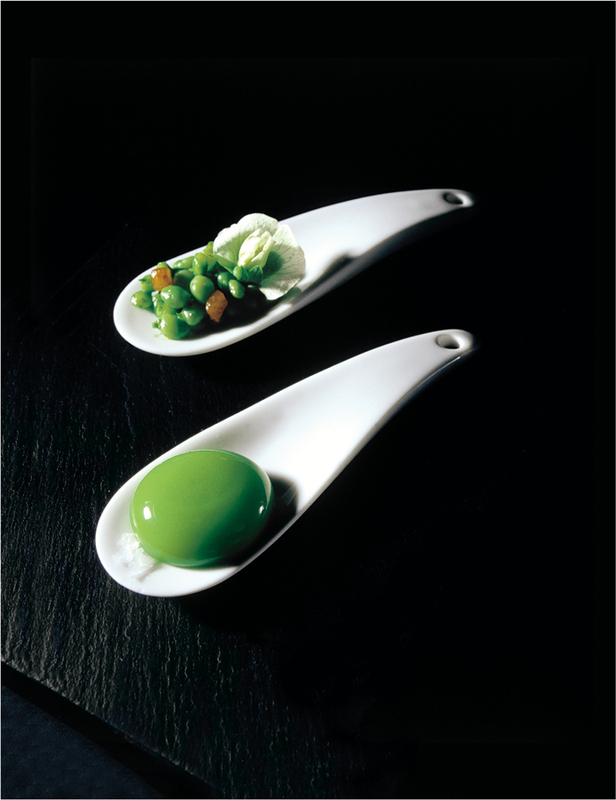 He delights the diners at elBulli, his restaurant near Barcelona, with creations such as gelatin served hot; a “bubble tea” drink in which the liquid tastes of prosciutto and the bubbles of melon; and jellybean-like objects the color and shape of a green olive—that burst in a splash of briny liquid when bitten. These are just a few of the hundreds of playful dishes the chef has served in his nearly 25 years at elBulli (declared the world’s best by Restaurant magazine for three years running, and four times in all). Adrià’s experiments with flavor, temperature, and texture have taken him into scientists’ terrain—and his future menus may get a boost from Harvard science labs. During a visit to Cambridge in December to deliver a guest lecture and to visit some of those labs, the chef signed an agreement with professors of physics and engineering for an ongoing collaboration. From postdoctoral fellow Jiandi Wan, who works with Joseph professor of engineering and applied mathematics Howard Stone, Adrià heard about double emulsions (tiny bubbles, each inside another thin bubble, dispersed in a fluid). Emulsions—defined simply as a mixture of two unblendable liquids—are everywhere in cooking: examples include butter, cream, salad dressing, and anything else that mixes oil and water. Emilie Dressaire, a doctoral student in the same lab, showed Adrià how she combines glucose syrup and sucrose ester molecules in a KitchenAid mixer to produce a foam made of “nanopatterned cells” that hold their shape and preserve a foamy texture in the absence of fat. 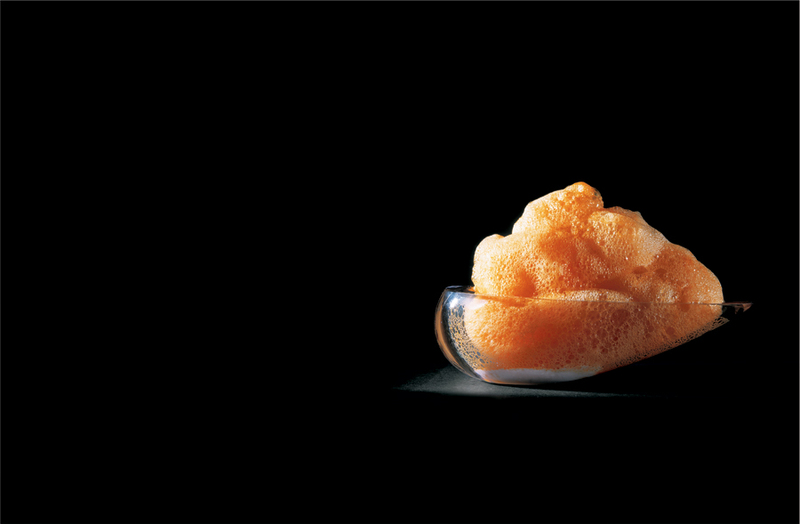 Dressaire thinks this technique could find an application in fat-free ice cream (see “A Durable Bubble,” November-December 2008, page 18); after poking a finger into a sample of the foam, kept in the lab refrigerator, Adrià mentioned that the elBulli kitchen had been using glucose syrup since 2005. For Campàs, who grew up during Adrià’s ascent to godlike status and learned to cook using the chef’s books and DVDs, the whole experience has taken on a tinge of the surreal. During an interview over lunch one day in January, Campàs’s cell phone rang; when he checked to see who was calling, the name “Ferran Adrià” flashed. And Adrià voiced hopes that Harvard scientists could help him better understand the principles that underlie his creations. Why is it easier to make foam from beets than from anything else he’s tried? Why do the melon “caviar” beads have a soft center at first, but congeal into dense, gummy balls if not eaten right away? Adrià said he hoped to collaborate on an encyclopedia of cooking and science that would explore these matters. He practically salivated as he listened to descriptions of the equipment in use in Harvard science labs, including a spin coater—which uses centrifugal force to coat surfaces with an extremely thin layer of a given substance—and Jiandi Wan’s machine for creating double emulsions. And then, of course, there’s the potential that Harvard scientists could help him solve problems that still frustrate him, such as making an ice cream that can be served hot without melting. Watch video excerpts from the public lecture.